We just planted our burning bush hedge this year. 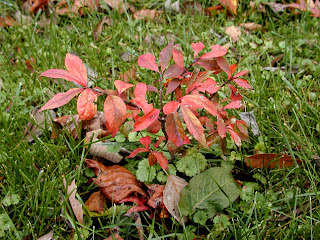 Last week, our baby burning bushes started turning crimson. We’re getting a glimpse of what will soon be one really beautiful section of the Inn’s property for guests to enjoy. The hedgerow has about 20 bushes in a smooth arc between the solarium and the Lake House. The hedgerow runs along the ledge of the creek bank. It’s going to be especially pleasing to the eye for guests staying in the Lake View and Mountain Laurel, both of which have windows overlooking that section of the lawn. More flora news to report: Our trees from the Arbor Day Foundation arrived today! We received flowering trees — they’re going to look great from the Terrace Suite.